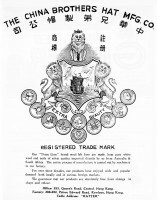 IDJ writes – This excerpt comes from a very useful book published by the Hong Kong government’s Department of Commerce and Industry dated 1955. It is a typical 180 page government handout to prospective overseas buyers outlining where Hong Kong is in the world and what the colony can sell or make for you. Essentially a commercial buyer’s guide to Hong Kong, possibly published annually. Can anyone provide further information about the history of their manufacture in Hong Kong, or specifically in the 1950s or when the last such hats were made here? 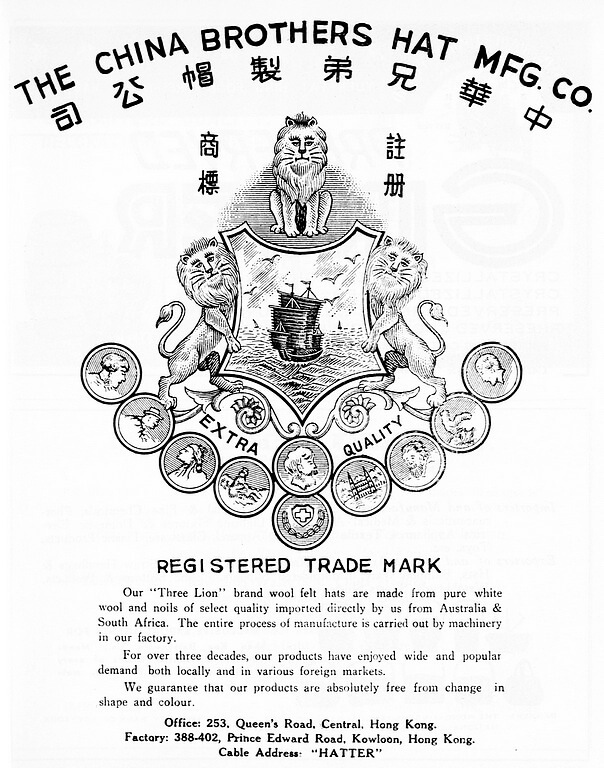 This advert from about 1955 is for “Three Lion” wool felt hats “made from pure white wool and noils [short strands and knots combed out of wool fibre] of select quality imported directly by us from Australia and South Africa. The entire process of manufacture is carried out by machines in our factory.” The factory was at 388-402 Prince Edward Road, Kowloon. Felt is a non-woven textile that is produced by matting, condensing and pressing fibres together from wool, fur or synthetic fibres. It is produced in many different forms for industrial, technical, designer, craft applications and of course hats. The latter are relatively soft but some types of felt are tough enough to form construction materials. It can vary considerably in terms of fiber content, colour, size, thickness and density depending on its intended use. Felt has been used to produce headware for many centuries and is possibly the world’s oldest textile material. Archaeological evidence suggests that from very early on, people discovered the tendency for fibres to mat together when warm and damp, many years before they learnt how to spin and weave yarn. Later, the “petasus” felt hat was made in ancient Rome. 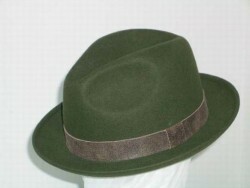 Until the 1920s all the operations necessary in making a hat were performed by hand but machinery was then introduced. 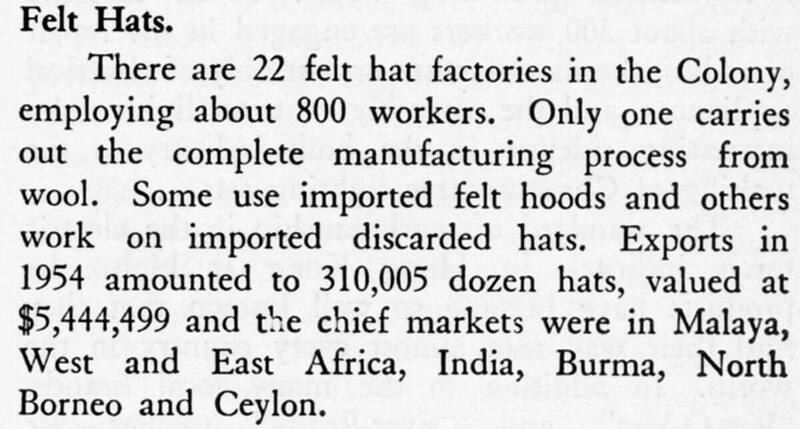 Felt hats are still made by Hong Kong companies though all the production centres appear to be in China. Thanks to IDJ for sending the first image, felt hat advert and core information from 1955. To add to this information about felt hats let me talk about the phrase “Mad as a Hatter” meaning a crazy person. In 18th and 19th century England mercury was used in the production of felt, which was used in the manufacturing of hats common of the time especially in the town of Luton. People who worked in these factories were constantly exposed to trace amounts of the metal, which accumulated within their bodies over time, causing some workers to develop dementia caused by mercury poisoning. The same was also true in the US when mercury nitrate was used when working with beaver fur to make felt. This condition became known as “The Danbury Shakes” after the town of Danbury, Connecticut, The use of mercury there didn’t stop until Dec 1st 1943 when hydrogen peroxide replaced the use of mercury. Does anyone know if and when mercury was banned in the Hong Kong felt hat industry? And were there cases of hat workers suffering the terrible effects as they became as “Mad As A Hatter”? I think that wool felt is not the same as that used in the US for example which was fur felt often beaver…and yes it was bad…mercury is around still in huge doses most notably now in vaxx and the oceans and lakes ( where a tiny drop of mercury will pollute an entire lake and of course all the fish in it…they must suffer terribly as do humans )..mercury psoning is causing dementia and alzehimers and parkinsons etc etc…and killing so mahy so slowly…pharma likes to create new names for this stuff ( big money is vaxx and new pills and you cant heal something unless you admit/know the cause ) but it is caused by the same poison: mercury.